What is a phantom pain? 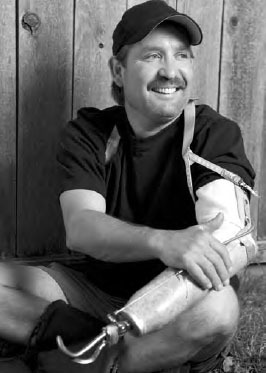 People who have lost their limbs to amputation often complain of feeling pain where the limb used to be. This phenomenon is known as phantom limb pain. Such an experience can be very distressing as it compounds an already devastating loss. Brain imaging studies have shown that phantom limb sensation is related to activity in the somatosensory strip and the sensory association cortices nearby. Neurons in the spinal cord still send pain signals to the parts of the brain that process sensory information from the amputated limb. This does not apply to just pain. For people who have lost their hands can imagine moving their fingers. When they do so, the corresponding area of the motor strip in the brain is activated as if the hand is still there. People who have had a limb or other body part amputated can still experience sensations like pain because the nerves in the spinal cord corresponding to that area of the body can still send signals to the brain (iStock).